Service Untitled» Blog Archive » Poach good service employees. DouglasOctober 20, 2008Behind the Scenes, Hiring & Training, Specific Companies Comments Off on Poach good service employees. I came across a blog post about how Apple recruiters are finding people to work at the technology company’s popular retail stores. Their method? Have a clever business card that says that the recruiter enjoyed his or her customer service experience and wants to get in touch with the employee if he or she is interested in changing jobs. 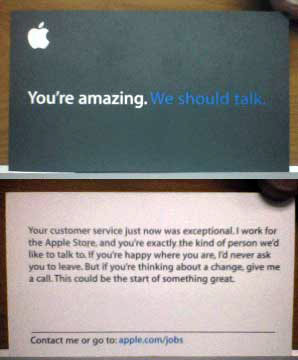 The card isn’t overly aggressive, but it does make a point – if you want to change jobs, consider the Apple Store. It is surprising that more companies don’t do this – especially considering how easy it is. It’s more direct (and I think effective) than a recruiter giving his or her card to an employee and it is obviously has a very specific purpose. Apple, like Nordstrom and other customer service leaders, realizes that you can hire the smile and train the skill. This tactic isn’t limited to retail. Assuming you train your employees and there isn’t a large amount of prior knowledge needed to work in your customer service department, this can work for your company as well. Look for great customer service and offer the card to people who seem like they might be a fit. If they work out, great. If not, oh well. Hiring is just as much an art as it is a science and a fact of both aspects is that it is hard to find and retain great people, so it is important to work hard at doing so. « Pass on praise to everyone.